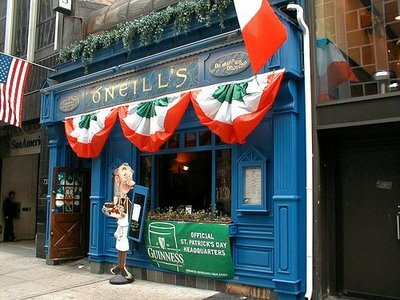 O'Neill's pub, New York City, St. Patrick's Day 2006. Photo by Flickr user MikeL-911, used here under a Creative Commons license. Let's start with the most outrageous major news story from this morning. Yes, AIG payouts to banks with TARP funds it received is outrageous. And yes, we need to know more about the relationship between Goldman Sachs and AIG. But I am referring to the Pope's opinion that condoms either can worsen or already worsen crises in Africa. I hope that we've reached a point in our history in which the words of a politician or religious leader cannot override scientific fact. Perhaps the right thing to do is to ignore Pope Benedict XVI, as we live in a secular world and shouldn't have to listen to what the leader of a shrinking, anti-sexuality, minority religion thinks about condoms, and the role they play in worsening crises in the world's poorest continent. But I am a strong birth control and HIV prevention advocate. I'm going to try a bad analogy here, but condoms are to the fight against HIV and unintended pregnancy what the AK-47 is to to rise of insurgent warfare. In other words, condoms are cheap, effective, and have changed the landscape in the context of their use (in this case, barrier birth control, not civil war). If anything, this world needs more condoms, not less (OK, that's where the AK-47 analogy ends - there's over 70 million Kalashnikov rifles in the world). The world still has a deadly pandemic on its hands, and the HIV virus is most transmitted in Africa and Asia. Condemning condom distribution and/or their use is an opinion that is not grounded in scientific fact, logic, or reality itself. It certainly seems to this author that the Pope discounted the effects of civil war, genocide, poverty, and refugee crises, and pointed a finger at a life-saving medical device for making life worse in Africa. Embarking on his first visit to Africa, the Pope said that distributing condoms is 'not the answer' to figting HIV in Africa. Well then, seat belts are 'not the answer' to reducing deaths in motor vehicle accidents. And immunizing children against polio is 'not the answer' to keeping the disease nearly extinct in the human population. Considering that Africa is the only continent where Roman Catholicism is growing, and the very conservative, irrational views of both the African senior clergy and the Vatican on issues of human sexuality and birth control, I think it is a fair prediction that the next pope will be African. It was my prediction last time, and I'm sticking to it the next time around. The growth of Catholicism in Africa has been explosive, thanks primarily to the strategic evangelical projects under Pope John Paul II, who visited the continent 16 times. "In the face of suffering or violence, poverty or hunger, corruption or abuse of power, a Christian can never remain silent," he said on his arrival. Certainly the Catholic Church is a powerful voice for peace and justice. I just feel that attacking condoms is highly ill-advised. Freedom is on the Retreat: Coup in Madagascar hands power to Andry Rajoelina, a man too young to become president under the current constitution. While I understand that outgoing president Marc Ravalomanana is not a poster child for democracy, I have to agree with the African Union that his ouster is an undemocratic coup d'etat. Late-breaking changes to Formula One rules: And there are a few of them. Drivers must put in more autograph session hours and be more available to the media. Low-budget teams will have the option to operate under a $42M annual budget cap in-exchange for more freedoms regarding technical and aerodynamic changes during the season. And car weights will now be announced (and published online) after Saturday qualifying. But most significant and surprising of all, the FIA has announced that the number of race wins will determine the drivers championship, with points only being used in the result of a tie. That's huge. Had that rule existed in years past, Philippe Massa would have won the driver's championship last season, and Nigel Mansell would have three F1 titles instead of one. My take is that this rule change is risky. What would happen if a driver won 6 or 7 races before August? Would he and the team have an incentive to sit-out consecutive races and coast-in for the championship come October? Races in F1 are all run on team strategy. So will the new strategy be to win the first race, and then do everything short of foul play to knock-out contenders in subsequent races? This will be interesting, but I fear it is going to be a bad experiment. There was a reason F1 used a points-based championship for decades. The current teams were asking for a restructuring of the points system and the FIA imposed a radical rule change instead. And last on my list, a recycled Slate St. Patrick's Day article: The man behind the green beer and myth, by David Plotz (originally published on March 17, 2000).